1880 - Maria Hains established a small inn at the cross-roads to cater for travelers waiting to cross the Brunswick River on the low tide. 1892 - First licensed hotel (Tramway) opened at Billinudgel. 1894 – Billinudgel Railway Station was built. Early 1900′s – Farming & Timber main industries in the Billinudgel area. 1908 – Billinudgel Hotel was built. 1958 - Developers of Golden Beach bulldozed shut Billinudgel Creek outlet into the Ocean at Helen Street. 1960′s – New Brighton Beach was used on a postcard advertising holiday destination. Late 1960s – Decline of the dairy industry in the valley. 1968 – Construction of the Ocean Shores Development commenced . First Sale Office at the entrance to Ocean Shores Estate (Cnr Orana & Balemo Drive). 1969 – Roundhouse was built as a Sales Office at Ocean Shores. 1972 – Ocean Shores Country Club & Course was opened. 1974 – Settlement of Sheltering Palms was destroyed by Cyclone Pam. 1974 – Council resolved to resume coastal land at Sheltering Palms and restrict construction due to the risk of cyclones and the historical significance of the area. 1976 - Council orders developers to close flood outlet. 1976 – Developers agree providing Council accepts responsibility for increased flood heights. 1976 – Council accepts liability. 1982 - Deputy Premier warns Council of their liability. 1983 – Stage 1 of the Ocean Village Shopping Centre opens. 1987 – Mothers Day (May) flood. 1988 - Council consultant warns Council and Councillors of their liability over ordered closure of flood outlet. 1991 – Shire Engineer surprised at significant reduction modelling of flood levels with outlet and dredging. 1991 – Council resumed the Roundhouse. 1992 – Bund erected at North Ocean Shores. 1993 – Ocean Shores Public School opened. 1993 – Levee constructed around Golden Beach raising flood levels elsewhere. 1994 – Roundhouse was demolished after a legal battle with Byron Shire Council. 1995 - Official Opening of the Ocean Shores Public School. 1996 – Lot 107 purchased as sportsfields for the Ocean Shores Community. 2004 – Casino to Murwillumbah railway closed. 2005 – June 30th rain event causing major flooding (Marshalls Creek) at Ocean Shores and around South Golden Beach and Billinudgel. 2006 – Lot 107 sold to RTA by Byron Shire Council. 2007 - Opening of the new Pacific Highway Bridge at Brunswick Heads as part of the Brunswick Heads to Yelgun highway upgrade. 2008 – Tweed Shire Council enlarged pipes under Kallaroo Circuit Bund. Byron Council re surfaced the road. 2008 - A plaque was erected at the entrance to Ocean Shores where the village of Hainsville once was located. Historical plaque on the Brunswick Valley was erected at Yelgun Truck Stop & Rest Area. 2009 - 40 year celebration of Ocean Shores Township Event held at Ocean Shores Country Club. 2013 – Byron Shire Council subdivided the Roundhouse site into 11 blocks. 2015 – Opening of the Llyod Poynting Walk Bridge connecting Ocean Shores to Billinudgel. 2016 - Byron Shire Council sold off the 11 blocks on the Roundhouse site. 2016 - Byron Shire Council commenced construction of Ocean Shores Soccer Field on Shara Bvde. 2016 – Council commences re-surfacing of the roads around Ocean Shores. 2016 – Major rain event and tidal surge (June). No houses flooded at Ocean Shores. Aussie Gateways Pty Ltd is a Website Management Service. 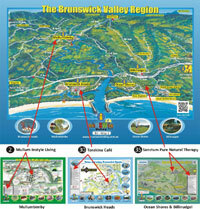 The information provided to us enable us to share with you the historical events of the Brunswick Valley. While every effort has been made to ensure the information on this site is correct, it is not always possible to achieve complete and total accuracy. Therefore Aussie Gateways Pty Ltd accepts no responsibility for any loss or damages which may occur to any persons as a result of information obtained from this site. Please contact us if you have any thoughts or ideas to share with us. Your comments are always welcome. Aussie Gateways Pty Ltd wishes to acknowledge the aerial photography work of Bill Mills and historical photos of Frank Mills, Judy Anning, Reg Burns, Billinudgel Hotel & thank them for the use within this web site.